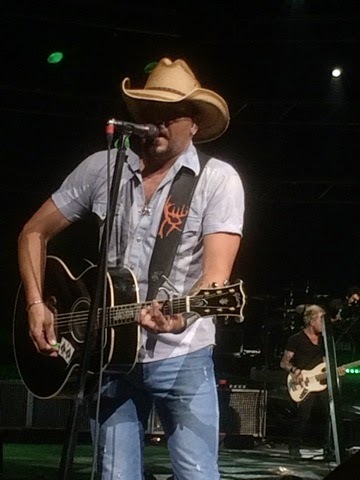 Jason Aldean brought his loud and rowdy tour to Hartford, Connecticut this past weekend, with a ample help from Florida Georgia Line and Tyler Farr. This was one of the sold out shows at the Xfinity Theater and it was apparent from very early on, as trucks and cars filled the parking lots hours before they usually do for these shows. What followed was an action packed show full of swagger, bravado, and high production. 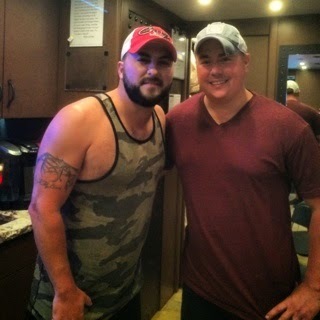 I caught up with Tyler Farr on his tour bus before the show. He spoke to me about being a Georgia Bulldogs College Football fan, touring with George Jones at 16 years old, his relationship with Willie Robertson of Duck Dynasty, and a new song he is recording with Jason Aldean called “Damn Good Friends”. Check out the full interview here: http://millertimemusicspot.blogspot.com/2014/08/tyler-farr-interview-august-2014.html. Tyler’s performance was very impressive as he showcased strong vocals and a very genuine stage presence. His five song set was a bit brief, but very memorable. He combined two new songs, including his new single, “A Guy Walks Into A Bar”, as well as three from his first album. 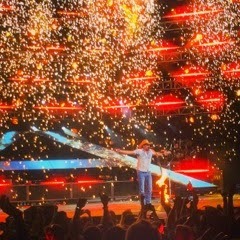 The final two songs got a huge response from the sold out crowd as he was able to put the microphone out to the fans as the whole Theater sang back “Whiskey In My Water” and “Redneck Crazy”. Tyler has a very distinct voice, which, in my opinion, sounds even better live than it does on the recordings. He has the songwriting chops, unique voice, and humble attitude to go a long way in this genre and I expect more big things to follow in his future. Up next was Florida George Line. Anyone who knows me personally, knows I am not a huge fan of their songs, but I kept an open mind as I watched them perform. 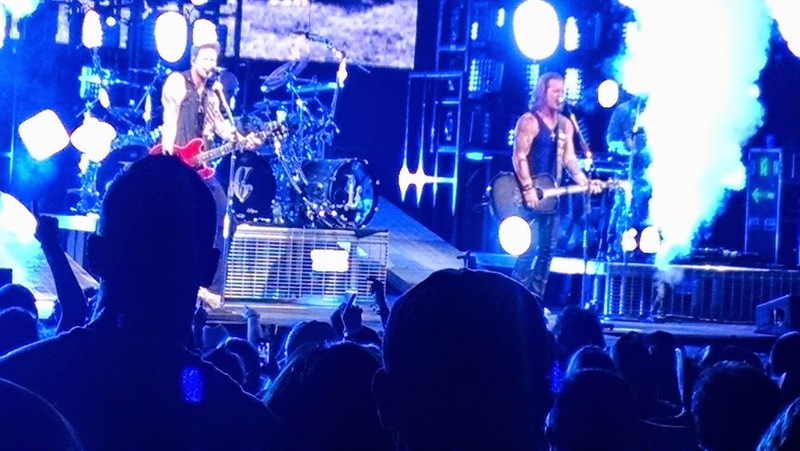 Both members of FGL were as active as anyone I have seen live as they used every inch of the stage. They included background visuals as well as a multitude of smoke blasts to enhance the visual performance. I don’t think their band was plugged in as it seemed to be a back track most of the time, but for the majority of the crowd it did not seem to matter. Their setlist included party song after party song and, albeit that I find the songs a bit corny and quite clumsy lyrically, the fans seemed to love them. 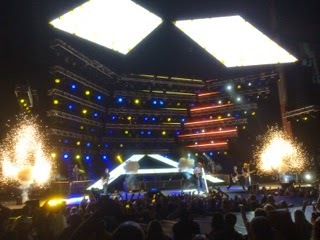 Jason Aldean finally hit the stage at around 9 pm and came out with some old hits first. Backed by a plugged in and raucous band, highlighted by the hilarious and talented drummer, Rich Redmond, Aldean’s performance was indeed the best I have ever seen put forth by him in the many times I’ve seen him. “Hicktown”, “Amarillo Sky” and “That’s My Kind of Party” were all performed early in the show, while he concentrated on a lot of the newer material in the second portion of the show. Aldean has stepped up his live performance game for this tour with stunning visuals, moving screens and lights, tons of pyrotechnics, and constant movement on stage. In fact, he smiled a lot more and genuinely seemed to be enjoying himself on stage. And why not? The crowd’s noise continued to rise as fans exploded into the aisles singing and dancing their hearts away. 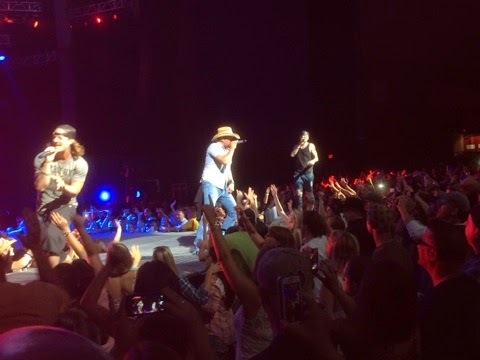 FGL joined him for “The Only Way I Know” as they attempted to sing Luke Bryan and Eric Church’s verses. Further, he performed his new single, “Burning It Down” (video clip below). 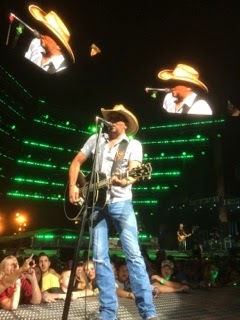 All in all, this was the best Jason Aldean show I have seen yet. All the intricate details were well conceived and Aldean and his crew masterfully executed. “Dirt Road Anthem” was as loud as I think I’ve ever heard a theater and the entire show had a feeling of electric energy. I really would not be surprised if this Tour and his upcoming album earned him a well deserved Entertainer of the Year Award. MTMS: I see you wearing a Georgia hat and there is Georgia stuff all over your bus here. But, didn’t you grow up in Missouri? Tyler Farr: I did. A lot of people ask me that, actually. You need to thank Rhett Akins, not Thomas Rhett, his father, of the Peach Pickers. They are some of the biggest songwriters in Nashville and happen to all be from Georgia. And they are die hard Bulldogs fans. When I moved to Nashville, Missouri really was not that good, so I did not have a team I rooted for like that. I did not get into college football until I moved to Nashville and walked into a room full of them cheering. I also now root for Missouri since they came to play in the SEC last year. But if Missouri plays Georgia, I just put all my colors away so I don’t get my home state mad. MTMS: Well, coming from Missouri, was there any particular artist that influenced you? Tyler Farr: My grandpa, he passed away when I was a Junior in school and he was like a father to me. He gave me my first guitar when I was 13. But I did not start playing until I was 16. He used to sit me on his lap and sing me old Hank Williams songs. My Mom and Dad used to sing a lot. My Dad actually was the last person to make All-State Choir before I did. And then my Step-Dad sang with George Jones. And I actually went on the road with George Jones for a month when I was 16. I rode the bus with the Jones boys and babysat George and Nancy’s grandkids. MTMS: Did you ever go out or have a drink with George Jones? Tyler Farr: I did not. This was post-Lexus wreck. So he kind of calmed down. But with some of those stories, I am glad I was not around for the drinking days. I’ve heard a lot of stories from my Step-Dad. But as far as music, he was a big influence. MTMS: In terms of causing trouble, I heard you are part of the Redneck Rat Pack with Lee Brice, Jerrod Niemann, and Randy Houser. How did that name come about? 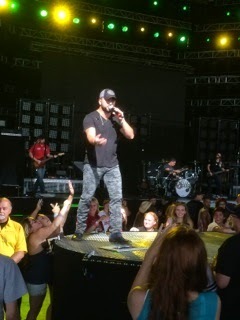 Tyler Farr: Yeah. I mean don’t put me down with that list. Nah, I’m joking. They are my buddies. The Rat Pack was not country, they liked their scotch. And me and my boys drink whiskey, and probably too much. I take it as a compliment to be put in with those guys. MTMS: Any chance you guys will record a song together or even an album like the Highwaymen did? Tyler Farr: I hope. I would love to sing with Randy Houser except he outsings whoever he sings with. It’s just not fun to play with him at guitar pull, belting out that big voice. How can I follow that? After you sang Anything Goes … thanks Lee, I have to follow More Than A Memory. They are all great talents. I hope there is a tour in the making in the future. MTMS: Who else have you worked with? 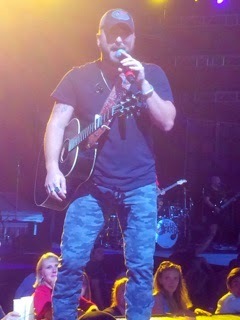 Tyler Farr: A lot of people. Willie Robertson, Colt Ford, Josh Thompson. A lot of these guys have been good to me and I am happy to be put in a category with them. I take it as a compliment. MTMS: I know you talked to Broadway (of www.country925.com) about hearing Willie Robertson rap on Colt Ford’s album, but did you hear him sing with Luke Bryan on the Christmas album? Tyler Farr: I missed that one. I have not heard it. MTMS: It was called Have A Hairy Christmas. Will he be on your next album? Tyler Farr: No. No. He can stick to the duck calls. I love him. He does a heck of a job as a marketing genius. I have a shower loofah someone gave me for Christmas of his face. I do not use it anywhere. It still has its tag on it. I just can’t get myself to wash down with a Willie Robertson loofah. It may even be made of his beard hair. MTMS: So he won’t be on the next album, will there be any special features from anyone? 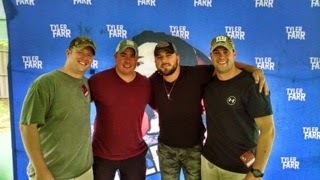 Tyler Farr: Jason Aldean will. MTMS: Can you tell me the name of the song? 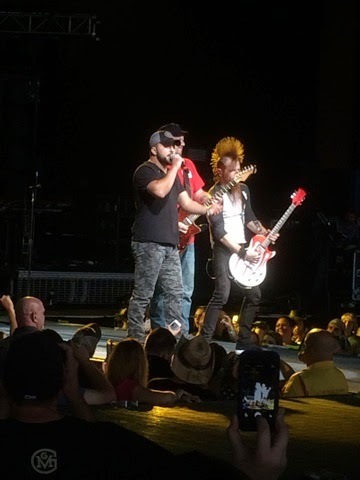 Tyler Farr: Yes, it’s called Damn Good Friends. MTMS: What is it about? 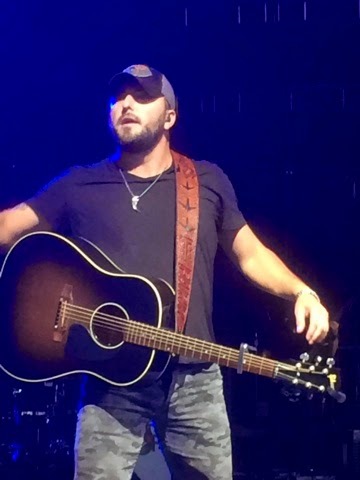 Tyler Farr: It is one of my favorites on the album. The main gist of the song is that you have a couple hundred buddies, but only a few damn good friends. It talks about breaking down, stuck out and the tow truck is taking too long, so who do you call? It’s an edgier take on You Find Out Who Your Friends Are. So, it talks about going into a bar and kissing on a brunette when an ex shows up and you see its going to be 3 on 1 and you need to call your friend. It also talks about getting married because I’m going through that as Lee just got married. I think he has had a litter of kids. And Jerrod is now engaged, so I felt like singing something like All My Rowdy Friends Have Settled Down. MTMS: So the next album will have some contemplative type songs? 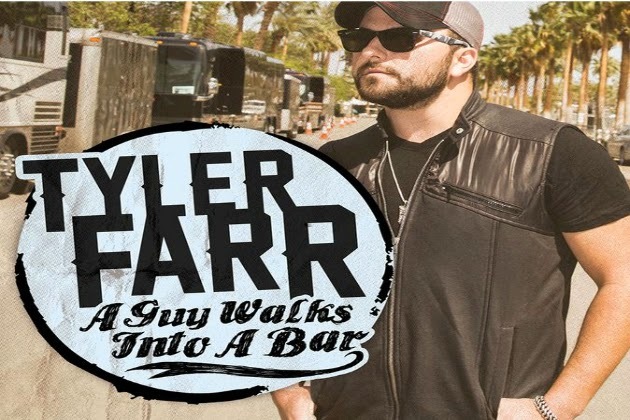 Tyler Farr: Yeah, with the new single A Guy Walks Into A Bar and the one with Jason, it is going to be a bit deeper.